With a commanding view of the grounds and surrounding woodlands, the Captain’s room is our flagship room. It features cool colors centered around an original painting of “The Captain”. Furnished with an ornate queen size bed, private bath and glowing fireplace, it will be a welcome respite on chilly Ohio mornings and evenings. Furnished with a comfortable king-sized bed, Susie’s Room is newly decorated to coincide with our “Country Elegance” theme. Susie’s Room has a DVD player, seating area and private bath. Enjoy the comfort of the soft colors and fresh linens. Also available is Susie’s Room with the Cub’s Room which would provide a more inexpensive option for four traveling together. Our Downstairs Guest Room is conveniently located on the first floor adjacent to our sitting room, but affords plenty of privacy. We have decorated it with Dutch Delft to reflect the hostess’s heritage. As we share this delightful room with you, we are sure you will feel warm and welcomed! 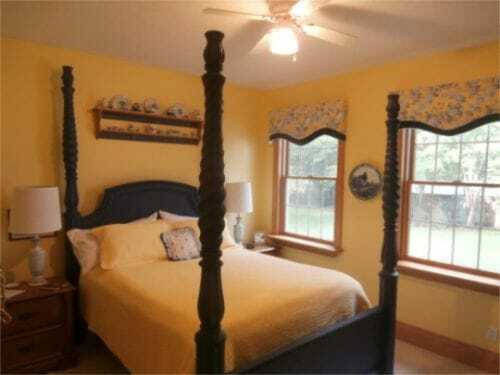 For families or couples traveling to our area for vacation or an anniversary get away, we offer our guest cottage. Higher rates during peak season. Suggested 2 night minimum stay.